In the old days, if you were hanging dry wall you'd have to drive 6,000 drywall nails a day to attach 3,000 square feet of drywall. That's the old way. Luckily, we now have specialized power tools to make working with drywall much, much easier. A drywall screw gun is similar to a drill, but is designed just for driving screws into drywall (Source). The screw gun utilizes clutches, which when pressure is applied to the bit, engages these clutches. Once pressure is released, so too do the clutches. Most guns allow users to set the depth at which they want the screw to sink into the drywall (Source). When choosing a screw gun, users have two main choices: Corded and cordless. Many users swear by the corded drills because, although not as convenient, you don’t have to worry about running out of a charge halfway through a job. As with all screw guns, being able to quickly and easily alter the depth is important, so look for that feature as well (Source). The DeWalt DCF620B is our favorite cordless model, while its corded compatriot, the DeWalt DW255 is our favorite corded- based on the user feedback we've analyzed. For this feature, we looked at 5 drywall screw guns of both the corded and cordless variety. The DeWalt DCF620B 20-volt MAX X-RAY Li-Ion Brushless Drywall Screw Gun is operated with a rechargeable battery, which frees you up from cords. It also features an ergonomic handle for less fatigue during long work hours. Also features a LED light to illuminate dark, tight spaces. Users praise this tool for being lightweight, quiet and its ability to hold a charge for a long time. This tool doesn’t come with a battery. The Hitachi WV6V4SD2 Super Drive Collated Drywall Screw Gun allows you to adjust the screw depth without having to reach in your toolbox for another tool. This drill accepts screw diameters from 3/4” to 2-3/16” and diameters from #6 to #12. Unlike the DeWalt above, this isn’t cordless. Buyers liked the versatility of this device and praised the company for offering helpful technical support. 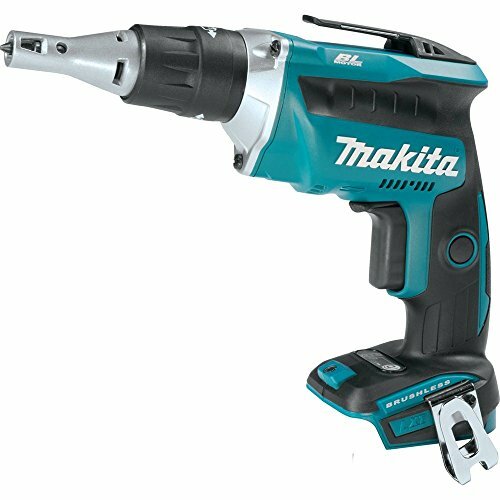 The Makita XSF03 18V LXT Li-Ion Brushless Cordless Drywall Screw Gun is another cordless model we looked at, and like the DeWalt, this one doesn’t come with a battery. What sets this drill apart is the motor, which delivers 0-4,000 RPM making it useful for more applications than just drywall. The brushless motor allows this drill to run cooler and extend the battery life. Of all the drills we looked at, users rated this among the highest. 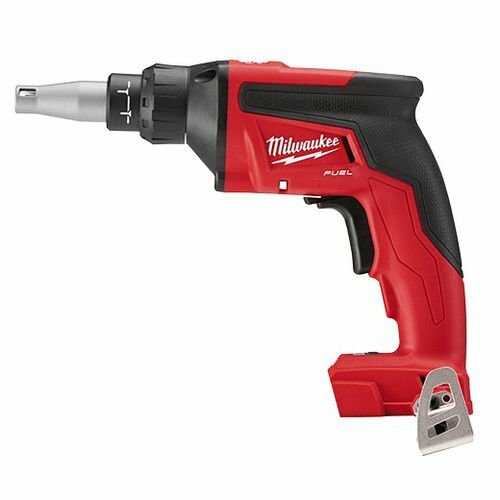 The Milwaukee 2866-20 M18 FUEL Drywall Screw Gun is another in the cordless variety in which the battery is sold separately. The brushless motor delivers 4,500 RPMs, which rivals that of corded drills. Features an auto start mode, in which the motor starts automatically when the bit comes into contact with the drywall. Depending on the battery you purchase, you can expect to do about 64 sheets on a single charge. Last up is the DeWalt DW255 6-Amp Drywall Screwdriver. Unlike some of the others we looked at, this drill is made in the USA, and unlike the previous DeWalt, this is a corded drill. Users praised this tool for the ease with which you can adjust the depth and how comfortable it is to use for long hours. 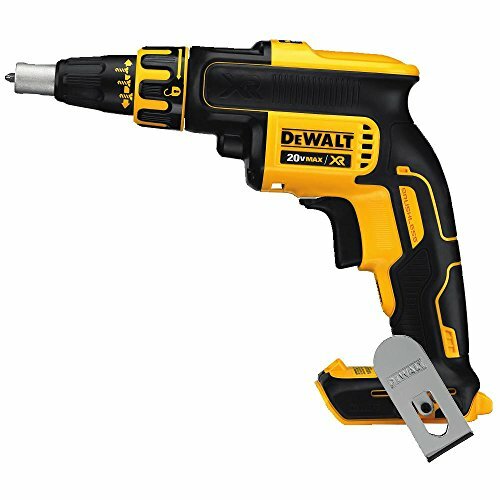 The DEWALT DW255 6-amp drywall screwdriver is a solid option for someone who wants a lightweight and ergonomic model. Users love the handiness of this tool, but some do complain of receiving a malfunctioning item. This tool is an HD VSR dry screwdriver. It is said to feature helical-cut steel and heat-treated steel gears for long life and durability. The manufacturer boasts that depth-sensitive, set-and-forget inch nose-piece allows for consistent depth. This item might be a solid choice if you need high-speed transmission for production drywall hanging. In general, buyers have a favorable opinion of the DEWALT DW255 drywall screw gun. They agree that it works very well, as well as that it is powerful, easy to use and versatile. Users conclude that it is great for both professional and amateur use. However, several purchasers complain of receiving a defective or already used item. If you are looking for a cordless drywall screw gun, you might want to consider the Milwaukee 2866-20 drywall screw gun. Users like the performances of this drywall tool, and so far have no complaints. According to the manufacturer, this product delivers up to three times longer run time than other cordless competitors. Its brushless motor, it is said, spins at 4,500 RPM, resulting in faster productivity. Thanks to the auto start feature, the motor automatically starts on contact with drywall, providing less noise between screws. This item could be a solid choice if you’re looking for a cordless screw gun that delivers the balance and weight desired by professionals for all day use. The general user consensus regarding the Milwaukee M18 drywall screw gun is that it meets their expectations. Users agree that it is lightweight, well-balanced in the hand and on the belt, with ergonomic grip. They appreciate that this tool allows for effortless screw insertion, as well as that it is very easy to adjust depth. In our research, we haven’t come across significant negative buyer feedback. The Makita XSF03Z brushless cordless drywall screwdriver could be a solid option for hanging sheetrock, metal framing, installing subfloors, backer board, and decking applications. Users love the power of this cordless drywall tool, but some complain about the weight. This product, it is claimed, delivers 0-4,000 RPM to handle a variety of drywall and framing applications. As the manufacturer boasts, its efficient BL brushless motor is electronically controlled to optimize battery energy use for up to 50% longer run time per charge. Another useful feature is the Extreme Protection Technology (XPT), which is engineered for improved dust and water resistance for operation in harsh job site conditions. This item might be a solid choice for drywall contractors who want a tool with a longer run time, increased power and speed, and longer tool life. The general user consensus concerning the Makita 18V lithium-ion drywall screw gun is that it is well-made, powerful and balanced. Purchasers appreciate that it sets the screw at the perfect depth, as well as that it is cordless. However, some buyers find it to be somewhat heavy. As one purchase states, you can’t hang it on your pants pocket. The Hitachi W6V4SD2 drywall screw gun is a solid option for those who want to make drywall installs much faster, easier and efficient. Users like the usefulness of this corded drywall tool, but some complain that the item they received wasn’t new. This product is said to feature a maximum speed of 4,500 RPM and an impressive torque rating of 81.5 in-lbs. As the manufacturer states, it fastens screws from 3/4″ to 2-3/16″ and screw diameters from #6-#12. This product might be a solid option if you are looking for the perfect combination of speed and power to tackle any drywall to wood or drywall to metal installations. 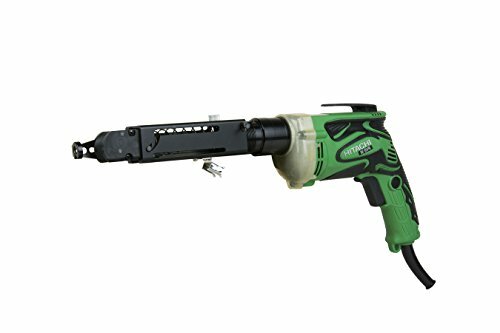 The general user consensus concerning the Hitachi W6V4SD2 collated drywall screw gun is that it works great and they find it to be a real time-saver. They appreciate that it has a long cord. However, several online reviewers state that the item they received wasn’t new but a factory refurbished unit. If you’re looking for a top-rated drywall screw gun, you might want to consider the DEWALT DCF620B brushless drywall screw gun. Users like the fastness of this cordless drywall tool, but some complain about the lever for switching direction. This product is said to feature high torque capability for wide range of applications. As the manufacturer boasts, it is ergonomically designed for less worker fatigue and provides optimum run time for a variety of jobs. The Li-Ion battery with fuel gauge is claimed to provide 33% more capacity over standard packs. This item seems like a good choice if you want a drywall tool powered by a brushless motor that delivers superior performance and maximum run time. In general, users have a very favorable opinion of the DEWALT DCF620B 20-volt XR Li-Ion drywall screw gun. Buyers agree that it is well-balanced, fast and easy to use. They appreciate that the tool is lightweight and cordless. However, some buyers complain that it might be a little awkward to get it adjusted since the lever switches direction easily. 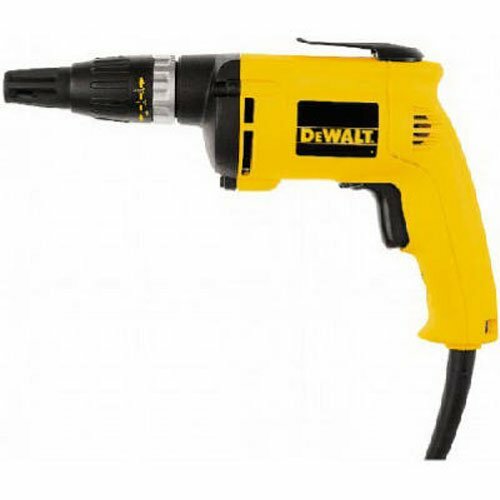 One disappointed online reviewer states that this drywall screw gun is perfect only for light use because after a few hours it starts to make a high-pitch noise. With a drywall screw gun, it is easier to fit and to install drywall to your home interior. Drywall is among the last things one will do to his/her home, however, it is worthwhile. Using a drywall screw gun you fasten the process of installing the drywall boards. It is very easy to use, and it will, in fact, work in the same way as an ordinary screwgun. With its automatic models, it will also be much easier to fix the drywall as you will not even need to care about having to carry screws with you. You should choose one with high quality. It will much simpler if you get a cordless one. Their battery needs charging, but when it is already charged you can take it with you to any place. There’s no need worrying that wires can get tangled. You can also use a cordless gun in a fast manner, and you can keep it in your tool belt for more convenience. These screwguns set bugle heads of screws just under the surface of drywall paper. The positive clutches of the tool engage every time you apply pressure to the Phillips bit. They release when the pressure is released. You can adjust both the depth of screw bit and the depth of screws set. As each screw is set to the proper depth adjustment, the screws pull the panel tightly against the framing, and pressure from the nosepiece in its turn pushes against the drywall. Then the head of the screw spins against the paper when it sinks, resulting in a slight dimple, as well as a smooth, clean edge around the head. As the screw reaches a particular depth, the clutch disengages. 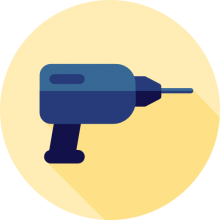 For using a screwgun, you simply hold the tool firmly and drive each of the screws. In that way, you absorb pressure with your hand and forearm. Your wrist needs to align with the nosepiece, while your thumb, index finger, and middle finger ride along both sides of the motor housing. You need to pull the trigger and then push the tool forward. That will engage the clutch, start the screw rotating, will sink it, and will disengage the clutch in a second. In case you do not maintain the pressure on the tool when the clutch is engaged, the screw will not set properly. Next, you are to load it up with screws. The automatic screwguns are the best as they store all the screws you need. The manual load guns work the same way as manual screwdrivers. Automatic models cost more, but they are much more useful and convenient. With an automatic screwgun, there is no need fixing each screw separately. Automatic models work with special drywall screws which you can get on coils. These screws will be loaded into the gun making it easier to drill and fix drywall. Put the drywall in the proper location and press up the screwgun against the drywall in the correct position to be screwed. Then press the trigger and it will automatically force the screw into the drywall to the necessary depth. When the drywall is already screwed in its place you can repeat this a few times so that the whole drywall sheet is fixed securely against the wall. There are many screwguns that have a setting to adjust head depth which can force the screw to drive deeper into the wall when necessary. This will hide the screw without having to rip through the drywall. You simply need to adjust the head depth making it suit your taping skills properly. It is quite easy to use the drywall screw gun; however, it might take you some practice before you master it. You will need to spend time for getting the right adjustments for the screws to be driven to the correct depth in the wall.